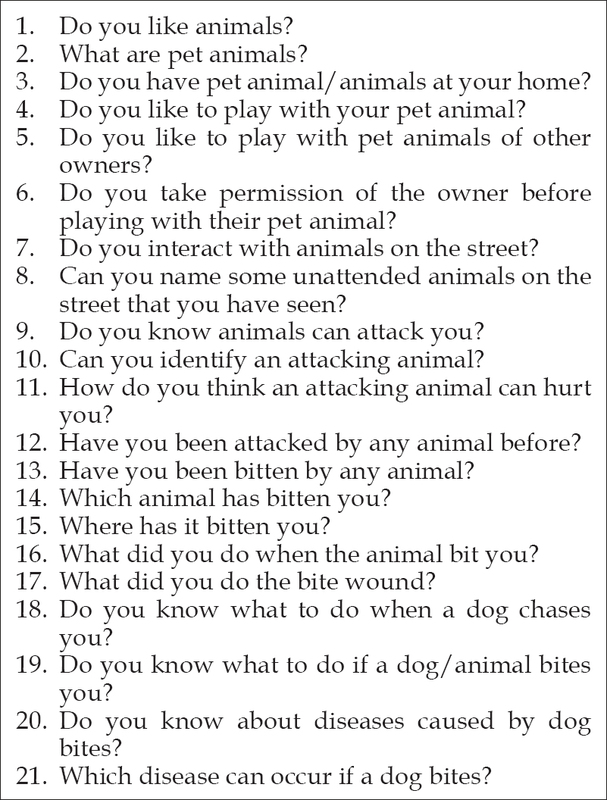 All the children were given a 21-item self-administered close-ended questionnaire to assess their awareness and experience of dog attacks and dog bite injuries [Figure 1]. It had questions aspects, namely, common site of injury from a dog bite, the source of dog bite exposure, attempt and success of any rescue skills used, and management of injuries after an event of a dog attack. Information on age and gender was calculated from all the children. The children were also trained to perform the rescue skills through demonstration and practice session. The rescue skill comprised of two sectors, one “being tree” model to deal with a chasing dog and “curl up into a ball” posture that prevents the dog biting the face, neck, thorax, and abdomen when the child is knocked down [Figure 2] and [Figure 3]. Our study suggested that dogs were the most common animals to attack children. The most common source of exposure in children is through their own pet dogs, while less commonly also through the dogs from their neighborhood and stray dogs. These findings were in agreement with other existing reports on dog bites in pediatric population which suggested that 43% of dog attacks arise from child's own household. Reports of some studies suggested that more than half of the incidence of dog bites occurred in children <12 years of age. The second peak of incidence was in children of 2–5 years., The literature suggested that the age of children was closely associated with the location of the injury, the face being the common site for a dog attack in children of 2–5 years, whereas the thorax and upper extremities become a common site in children 6–12 years of age.,,,, The results of our study were in agreement with these findings on the location of the injury correlated to the age of the children. Since the children who participated in our study were 7–12 year old, the hand was the most common site inflicted by dog attacks than the face. However, more clearly the factors that can determine the location of injury were related to the height of the child, nature of the attack, as well as the height of the attacking dog. Chhabra S, Chhabra N, Gaba S. Maxillofacial injuries due to animal bites. J Maxillofac Oral Surg 2015;14:142-53. Wei LA, Chen HH, Hink EM, Durairaj VD. Pediatric facial fractures from dog bites. Ophthal Plast Reconstr Surg 2013;29:179-82. Jaindl M, Grünauer J, Platzer P, Endler G, Thallinger C, Leitgeb J, et al. The management of bite wounds in children – A retrospective analysis at a level I trauma centre. Injury 2012;43:2117-21. Foster MD, Hudson JW. Contemporary update on the treatment of dog bite: Injuries to the oral and maxillofacial region. J Oral Maxillofac Surg 2015;73:935-42. Lin W, Patil PM. Facial dog attack injuries. Indian J Surg 2015;77:55-8. Oginni FO, Fagade OO, Akinwande JA, Arole GF, Odusanya SA. Pattern of soft tissue injuries to the oro-facial region in Nigerian children attending a teaching hospital. Int J Paediatr Dent 2002;12:201-6. Morgan M, Palmer J. Dog bites. BMJ 2007;334:413-7. Schalamon J, Ainoedhofer H, Singer G, Petnehazy T, Mayr J, Kiss K, et al. Analysis of dog bites in children who are younger than 17 years. Pediatrics 2006;117:e374-9. Ozanne-Smith J, Ashby K, Stathakis VZ. Dog bite and injury prevention – Analysis, critical review, and research agenda. Inj Prev 2001;7:321-6. Abuabara A. A review of facial injuries due to dog bites. Med Oral Patol Oral Cir Bucal 2006;11:E348-50. Toure G, Angoulangaouli G, Meningaud JP. Epidemiology and classification of dog bite injuries to the face: A prospective study of 108 patients. J Plast Reconstr Aesthet Surg 2015;68:654-8. Wiseman NE, Chochinov H, Fraser V. Major dog attack injuries in children. J Pediatr Surg 1983;18:533-6. Meyers B, Schoeman JP, Goddard A, Picard J. The bacteriology and antimicrobial susceptibility of infected and non-infected dog bite wounds: Fifty cases. Vet Microbiol 2008;127:360-8. Ugboko VI, Olasoji HO, Ajike SO, Amole AO, Ogundipe OT. Facial injuries caused by animals in Northern Nigeria. Br J Oral Maxillofac Surg 2002;40:433-7. Wellman HM, Cross D, Watson J. Meta-analysis of theory-of-mind development: The truth about false belief. Child Dev 2001;72:655-84. Ketelaars MP, van Weerdenburg M, Verhoeven L, Cuperus JM, Jansonius K. Dynamics of the theory of mind construct: A developmental perspective. Eur J Dev Psychol 2010;7:85-103. Miller SA. Children's understanding of second-order mental states. Psychol Bull 2009;135:749-73. Lu H, Su Y, Wang Q. Talking about others facilitates theory of mind in Chinese preschoolers. Dev Psychol 2008;44:1726-36. Schwebel DC, McClure LA, Severson J. Evaluating a website to teach children safety with dogs. Inj Prev 2015;21:e2. Das UM, Nagarathna C, Viswanath D, Keerthi R, Gadicherla P. Management of facial trauma in children: A case report. J Indian Soc Pedod Prev Dent 2006;24:161-3.